…. well, I suppose we’ve got new signs directing people to the new KRE. It’s a bit quiet, isn’t it? A bit too quiet on the signing front, if truth be told. Our last signing of any note was Stacey Long just under two weeks ago, and we had this rather unpromising sounding interview last week. [Manager David] Oâ€™Keefe has organised a stint [for McNamara] with AFC Wimbledon, followed by a couple of weeks at Doncaster Rovers in mid-July and subsequently Malmo in Sweden and Shamrock Rovers in Ireland. So we’re really not significantly further forward from a month or two ago. And pre-season training isn’t many moons away. You would hope – and this being AFCW, it is hope rather than expectation – that if we’ve dipped out on initial targets we have a second list of solid-if-unspectacular L2 journeymen who will comfortably keep us in the division. Our problems will start if we haven’t. Considering how many players we got rid off in the last cull, it was going to be a bit of a task to replace them with better – not equal, better – especially as we have a lower budget than Raynes Park Vale. Are we about to see the first signs of panic buying when the 1st July comes around? I hope we don’t, but it wouldn’t surprise me to see a few more youngsters released from Championship sides joining us, instead of and not in addition to genuine L2 quality players. So I guess it’s just the usual waiting and seeing. Other clubs in this division may well be in the same boat, Port Vale are apparently, although on the flip side that means we won’t be the only ones chasing those players without contracts. It’s still going to be a test of not only what we can offer players, but also how we sell ourselves to them. We thought you might be interested in hearing a little bit about what happens in discussions with potential new signings. By the time we meet them, we already know pretty much all we want to know about them, so the meeting is usually about explaining the club to the players and, of course, discussing wages. 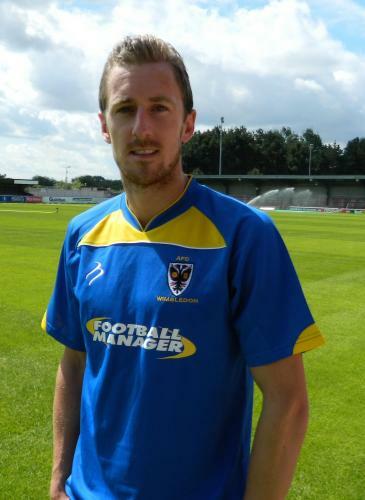 Terry sells AFC Wimbledon very well. He almost always starts by saying â€˜this is a Proper Clubâ€™, before going on to explain the background to the club, our volunteer base and our ethos. After showing them the pitch and eulogising about the quality of the playing surface, Terry talks them through his plans for the season â€“ and, finally, wages. After hearing Terryâ€™s talk, both Elliott and Belal signed on the spot. That was written before ourÂ Conference South season, which may give you a little reminder of how far we’ve come. Of course, that was written in the days when we were part-time, and could get virtually any player we wanted. Still, as we all know by now, we’ve secured Jack Midson again. So presumably nobody came in with the right bid for him 😉 While there is always the risk of him being a one-season wonder, at least it’s another position we don’t need to fill PDQ. If he does repeat his goalscoring next season, the alleged Â£100k bids will suddenly become nearer Â£400k, and by that stage we really would be stupid not to cash in. Hell, Byron Harrison might have figured out he’s a striker by then. It comes to something that we’re collectively paying more attention to where some of our released players have ended up. Bush at Gatesheed and more surprisingly Hatton at Grimsby are the two big news stories. While neither of them made the step up to L2, both are decent enough Conference players and are at their correct level. While it doesn’t take genius to work out that many players last season were above their level, you do wonder if they could have had another season together in L2. They were a unit that got us up to the Football League, after all, and the system they had to play seemed to make them look worse than perhaps they were. We’ll never know how many of them would have got a second season in L2 if they hadn’t been hindered, especially by the lack of any sort of clue over our defence, but it is telling that individually they won’t be wearing nPower badges on their shirts. Still, they’re the past, and we’re awaiting our future to arrive. Time isn’t as long as you may think, especially as these days getting it right in pre-season can prove a difference between struggling and not. And we do need a good start, for many reasons. Boy is your glass half empty! We know that the transfers don’t get going until after payday at the end of June and many players will be hedging their bets at this stage. Apart from wanting to see Jack Midson again next season, re-signing the league’s highest scorer can only help attract others. Just think. last year we lost 3 of our best players in Kedwell, Gregory and Mohammed, and by this time we had signed Max porter and Chris Bush. We then got MMK who didn’t play fo 6 months and Charles Ademino who offered nothing (even in his reputation) to suggest he would ever do anything for us. My point being that this summer is clearly going far better and we have learned from past mistakes. Personally I would be far more worried if we suddenly unveiled 5 new players. Thats the dynamite fishing approach that left us with so many players on the payroll that didn’t even feature after christmas last season. Whilst I’d agree a couple of league standard defenders are in order, I’d be happy for Terry to use the PSFs to scout his last couple of signings. Keeps them cheap, and very keen to impress. Hoping Strutton will shine, and that perhaps is young enough to be moulded into a wider player to work with Terry’s system. The Aussie keeper looks promising, and I’d be happy to see him genuinely challenge Seb for the shirt. In fact, I’d start him in the PSFs and send a message to Seb and him that the spot really is up for grabs. As for LB, don’t we still really, really miss Hussey? Funny to think he only played a season and a bit yet his position has, since then, been a problem. Personally, I would prefer a 35-38 year old keeper, one who is looking to break through into coaching but still has the ability to play some L2/JPT games. Last season suggested that Seb needed to up his coaching, not only for his own development but also for us to sell him for maximum Â£Â£Â£. Strutton is gone I believe, although every pre-season has triallists. Though am I right in thinking no triallist we’ve ever taken on has ended up in the first XI? At least since Conf South days. Waiting to see who comes available on 1st July works best if you’ve earmarked 2 or 3 players you know are going to become available, but at the same time it’s easy to get it wrong. Especially if you know you have to sign somebody. I do expect more signings though, and L2 quality ones to boot, but we should be getting what we want/need, and not who’s being sold off with a markdown price. It’s certainly very true that the trialists very rarely make the grade. Seb Brown is a notable exception though. I totally agree about the goalkeeper. It seems that if we get a young inexperienced goalkeeper we would end up getting a loan in if Seb got injured anyway. However much potential a young goalkeeper has. you can’t just throw them into league 2. Overall though, six signings, with three coming early in pre season and three late on, was about the best anyone could have expected I think. It would be great to have the whole squad in place by the start of pre season, but it’s certainly not mandatory, and not really realistic when you’re working with a small budget. I’m a fan of returning to the navy colour of late 90s WFC. That is a classic case of the design looking better on paper. Methinks the kit manufacturer should stick to the plainest design possible, as it never seems to get anything remotely patterny correct – saw a guy at a bus stop yesterday wearing the Conference South era shirt, and it just looked wrong with its yellow stripes. Never understood why we needed to rush it out unfinished – surely far better to wait until it was and not give a bad first impression?